Ruben Loftus-Cheek has once again proved a point to Maurizio Sarri. The 22-year-old came off the bench to wrap up the three points in yesterday’s West-London derby with Fulham. The England international had replaced Mateo Kovacic, due to injury in the 67th-mimute, with Chelsea leading 1-0. With The Cottagers seeking an equaliser, Loftus-Cheek proved the difference after linking up with Eden Hazard. An excellent finish from just inside the box eased the tension at Stamford Bridge. 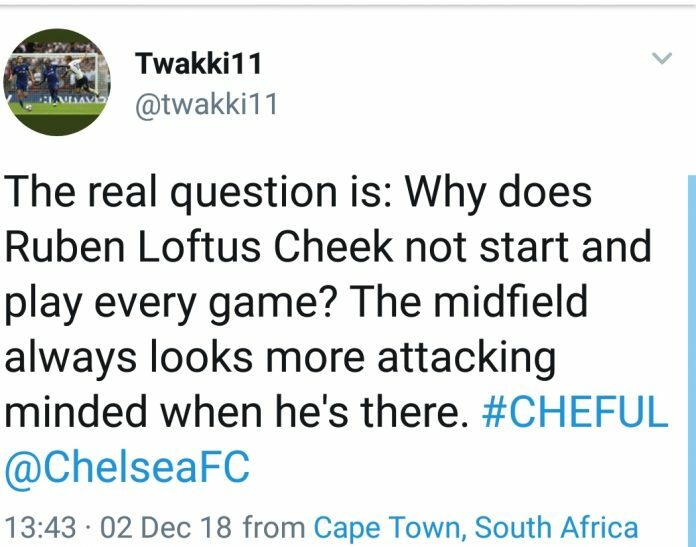 It’s not the first time Loftus-Cheek has made an impact this season. A wonderfully taken Hat-trick against BATE Borisov in the Europa League raised eyebrows amongst Blues fans. Chelsea supporters were further impressed by his late performance yesterday, as they took to social media to show their approval. Questions have been asked about his lack of game time. The Blues youth product returned last summer from an excellent year on loan at Crystal Palace. His impact at Selhurst Park earned him a call-up for Gareth Southgate’s World Cup squad. Loftus-Cheek was only a bit-part player for England, but did enough to convince Blues fans that he was worthy of a place in Maurizio Sarri’s first-team. Things haven’t quite gone to plan though. The emergence of January signing Ross Barkley, and the loan signing of Real Madrid’s Mateo Kovacic, has seen the England international short of first-team minutes. Statistically Loftus-Cheek is showing a competitive edge that Maurizio Sarri will find hard to ignore. Yesterday’s strike was his fifth goal in nine appearances this season. 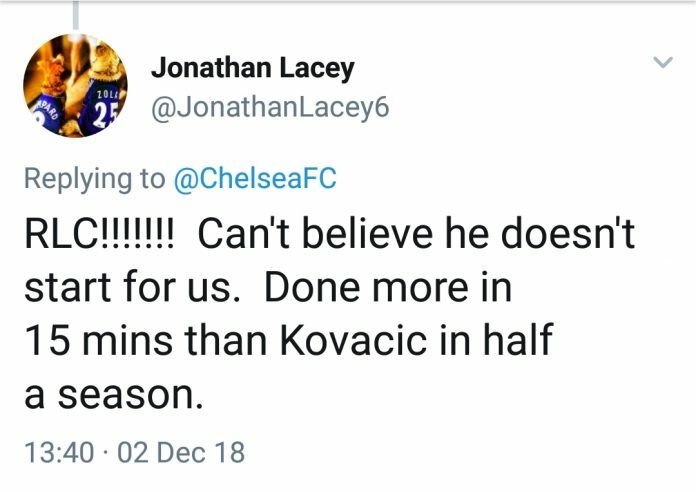 In contrast, Kovacic has one assist in seventeen appearances, and is yet to find the scoresheet. To be fair to the Croatian he is involved heavily in the build-up play, and stats aren’t everything. Ross Barkley has weighed in with three goals and four assists from eighteen appearances. 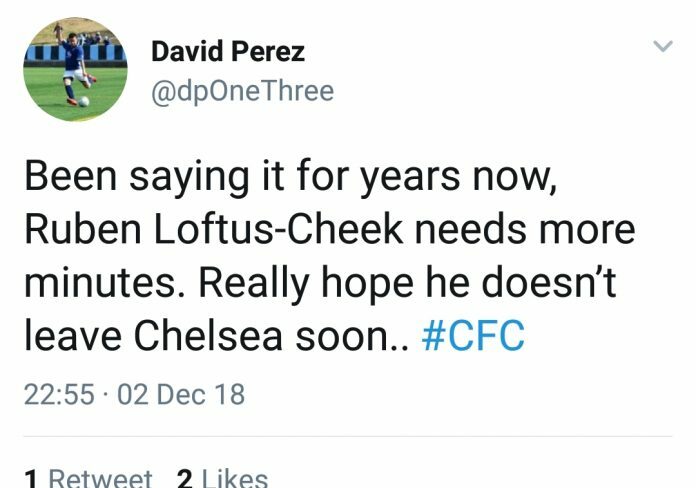 What happens in January will be of vital importance to Loftus-Cheek’s career. 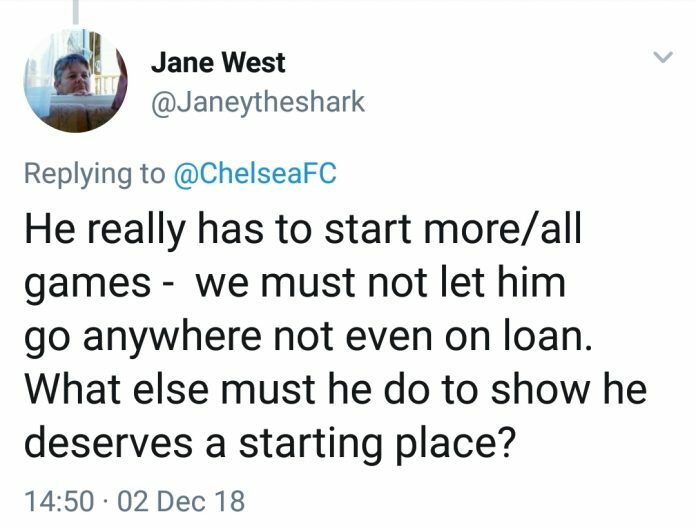 A lack of game-time will only hurt his progress, and another loan is a possibility. Crystal Palace will certainly be in the queue to sign him on a short-term basis. However, there are bound to be other clubs interested in a player that is now a recognised full international.